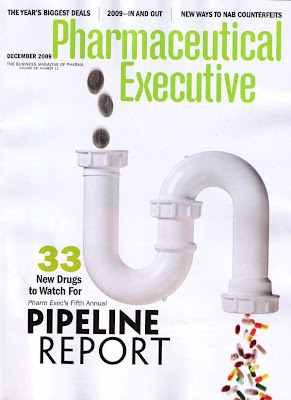 Pharma Marketing Blog: Pharmaceutical Executive Magazine's Drug "Pipeline" Looks More Like a Money Drain! Pharmaceutical Executive Magazine's Drug "Pipeline" Looks More Like a Money Drain! Whenever I hear or read about pharmaceutical executives bragging about their product "pipelines" to Wall Street investors I think of the Alaska oil pipeline -- a huge and imposing structure, carefully engineered to bring me a product I need and desire. I don't think about bathroom drain pipes discharging waste that I want to get rid of. But that's apparently how the editors of Pharmaceutical Executive Magazine see drug pipelines if the cover image of the latest, December 2008, issue is any guide. PE has chosen to represent a drug pipeline by the type of PVC drain pipes commonly seen under our bathroom sinks, complete with the U-shaped "sludge" trap and all. PE shows money flowing into its "pipeline" at one end and pills coming out the other. But we all know that with bathroom drains, it's always garbage in, garbage out! Is there some kind of subliminal message that PE is sending here? "Money down the drain" comes to mind! 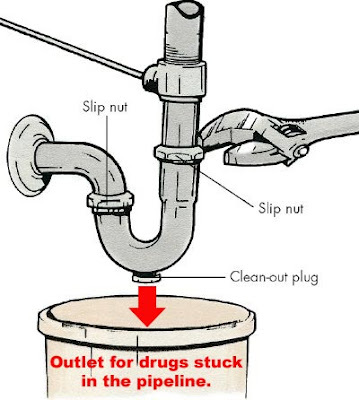 PE forgot to add one little important feature to its "drug R&D money drain" image: a handy-dandy clean-out plug for removing products stuck in the pipeline (see image below). For more on how useful that is, see "torcetrapib: '$800 Million' Failure but Kindler Safe."